I know, stunning, is it not? C'mon, sure Yoda hats are groovy, but I don't think anyone's got one of these! Then again, I don't know that anyone would want one of these either. Okay, so my style is a bit, um, unique. Whatever. At least I've got appropriate apparel for this event. OK, start crocheting about 50 of these to take with you and sell them for at least $99.95 each while at the show. You can walk around inside with one on, and send everyone who stops you out to a cohort who will sell them out of your trunk in the parking lot. I want one, and know aat least one other person who would kill for one. Hah!!! 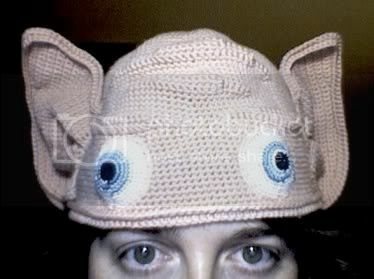 I've been making hats with ears too. HOWEVER, my current hat is the oh toooo cute Kitty Hat. LOVE your baldy guy...the wrinkles in his brow are amazing! Your imagination just leaves me in awe. Oooh, better yet--a crocheted one ring!! With embroidered lettering. Ok, I know, I really get into LOTR stuff!! I agree with the first comment! You could sell them at the show, Regina! My mom suggested I do this when I knit up a "BEAT LA" beanie (forgive me SoCal Dodger fans) for a Giants game and I could have sold a dozen of those at the ballpark with the amount of people that came up to me. And, in my experience, LOTR fans are even more enthusiastic than drunken Giants fans. So I see your vacationed served you well in the creativity department! You are too much! Crazy thing is, I know a number of small people that would flip over that hat. Too much!! so effing cool! you always bring a smile to my face. thank you. Hobbitaciously incredible! You are one of a kind. Never in my life have I seen anyone create such wonderful art with crochet. You are absolutely my inspiration. That is hillarious! You are so talented. Oh, this is wicked. Would you give your permission for me to post the photo (and link, which will go up regardless :) on the Crochet Me blog? Oh, my husband wants one of these, like, yesterday!!! You constantly amaze me, girl. You really brighten my day! Aaaack!!! You are amazing!! I agree, you should make a few and sell them, or at least take business cards to give to the hoardes of people who will stop and ask you where you got your fabulous lid! That is by far the best hat I've seen in quite some time! I agree with all of the previous comments - especially about it being the creepiest ever! BUT I WANT ONE. And I'm not even that into LOTR!!! You are amazing. oh my goodness!!! love it! how perfect is that - why do i not think of these things? It is wonderful, I love it! Oh my God! Oh my God!! Oh my God!!! How do you think this stuff up?! 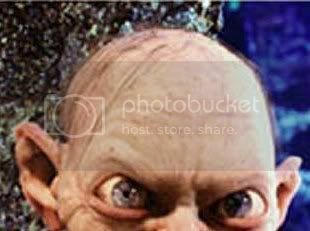 I want a Gollum hat!!! I can't handle it. I have been laughing since I saw it yesterday ... if you sell the pattern, i'd SO BUY IT. WOW!! Hi! this is that is to be criative !!! !I LOVED! take care! OMG!!! that hat is soooo cool! 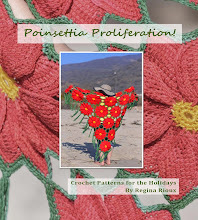 as always, i bow in your Crocheted Presence! The Preciousss hat is hilarious. I love that you would even think of making this! How cool!